Fellow Nigerians as is expected everybody and their blog alter ego has a take on current situations in the nation. Well not to be outdone here’s my own, only that it’s in a “no long thing” format. Cheers. My verdict: not a bad policy. A lot of the people against it just haven’t fully understood or read up on the implications. But Soludo does deserve some heavy knocks for not thinking of it earlier and allowing millions to be wasted on the now needless new coins and notes, plus millions more that are yet to be wasted on further reprinting and mass-enlightenment. The only part I hate is the coins reintroduction; I don’t think we’ll ever get used to that again. Like some other people thinking about this just makes me go “oh dear”. The Niger Delta might be getting the raw deal off their oil but violence is never the way to go about solving problems. All the cultist and militants are frauds; they’re all in it for the money. The police and military should for once wake up to their core duty of protecting life and property and deal with situation effectively. The House of Reps case being the latest example of this phenomenon. Blame this on our “chop-and-quench-tomorrow-fit-no-dey” psyche. It’s a shame we’ve gone so selfish misusing vast amounts of wealth not knowing that these same amounts can do wonders for local infrastructural community development or as grants to the less privileged. 8,500 Naira might be chicken change to a few people but for a lot of others particularly youth corpers it’s often been a life saver. I know that in liberalized societies like the US and UK there is the tendency for the family system to be fucked up. But even worse things happen in the so called socialist, value-respecting societies. The fact is that democracy and its inherent freedom is the best way ever for society to live by. We’re all mortals and equals; no man has the right to forcefully impose his will or standards on others. We should chill with all the religious and moral hypocrisy and allow people to indulge as they like. It’s a free world, it’s their life and the consequences are theirs to bear alone. I couldn’t care less about this. We’re already too obsessed with that league for our own good. Hopefully this will afford people the chance to now get a life. And instead when we keep it football it’ll now be by watching the Under-17 and Under-21 male teams, they seem to be doing well these days. And there’s even added joy with the Super Eagles; Berti Vogts has been getting us the friendlies on a regular basis! Although our joy would be complete if the games were transmitted live. We all have what we’re extremely passionate about and will defend till death, in Uche’s case it’s his beloved Ndigbo. It’s just that he took it overboard. No one’s perfect we all err; so everyone who's been on his case is better off giving him a break. They should note that an advice given harshly often defeats its aim as it ends up upsetting its' target instead of correcting it. 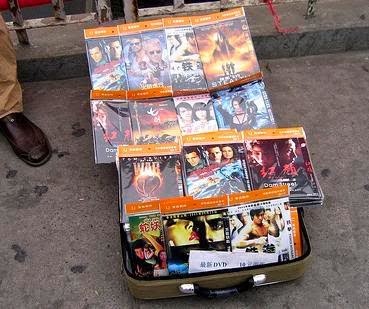 I’ve never watched as much movies as I’ve done in the past one month, (no) thanks to pirated DVDs from China that are now flooding the Nigerian market. Anyways it’s great stuff: very cheap top quality films to watch at will with little hassles! Good to see you back, you dey enjoy China awuf film eh? I go call Copyright Commission o! OOh Jess! I love the new layout. Way to go, man!